At this morning’s opening of the Hot Docs Forum it was announced that Hot Docs and Blue Ice Film have partnered to establish the Hot Docs-Blue Ice Film Documentary Fund. The $1-million production fund will provide financial support to independent documentary filmmakers based in developing African countries, with the goal of increasing the quality and quantity of social, cultural and political documentaries produced in the region. Generously established by Toronto-based Blue Ice Film, the Fund will be administered by Hot Docs and disbursements will be made over the next five years. The Hot Docs-Blue Ice Film Documentary Fund will disburse six to ten grants each year to successful applicants for projects in various stages of production. Grants will range from $10,000 to $40,000. In addition to financing, the initiative will also offer valuable resources and industry connections. Through an accompanying mentorship program, selected African producers will team with international production partners to bring their projects to international markets, festivals, broadcast and online audiences. 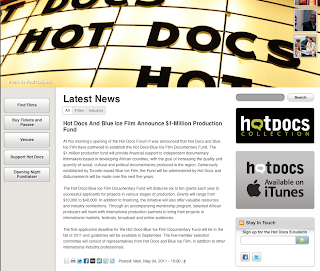 The first application deadline for the Hot Docs-Blue Ice Film Documentary Fund will be in the fall of 2011 and guidelines will be available in September. The five-member selection committee will consist of representatives from Hot Docs and Blue Ice Film, in addition to other international industry professionals. South Africa's Film Industry Comes of Age?